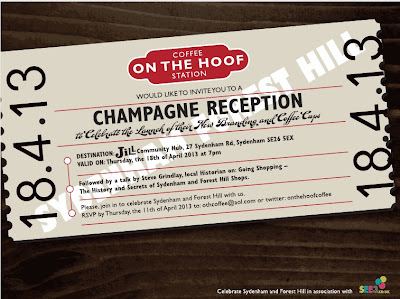 Celebrate On the Hoof’s launch of its brilliantly local cups at a champagne reception and learn from local expert. Did you know over 5-million people travel through Forest Hill and Sydenham stations each year? Or that Rolf Harris and Bill Wyman once lived in SE26? We learned these fun snippets from On the Hoof’s new takeaway cups, which are packed with local facts and insights. Sydenham resident Ela has built a loyal customer base at each of her superior coffee kiosks and was the first company to bring freshly ground coffee and expert barista skills to Forest Hill in 2001. Since then, On the Hoof has grown to provide a second kiosk at Forest Hiill and further kiosks at Sydenham and Shortlands. Gourmet sandwiches are made daily on site and patisserie is delivered from local artisan bakers. Even the tea is sourced from Imporient, a specialist tea merchant based in Sydenham. All of Ela’s eight staff are local residents who are trained to provide a personal service to customers, even coming to know regulars by name and coffee preference! 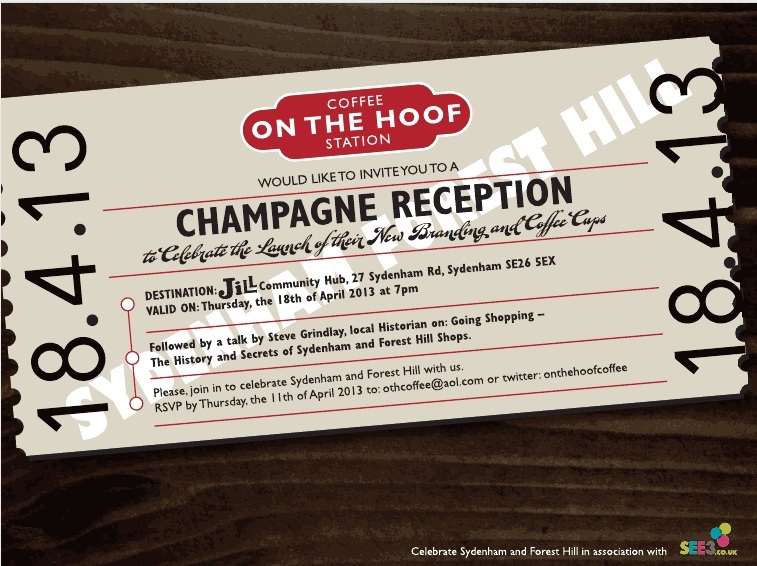 As a special treat, Ela has invited renowned local historian Steve Grindlay to give a fun talk entitled, ‘Going Shopping –The History and Secrets of Sydenham and Forest Hill Shops’ at a champagne launch to which you’re invited. Come and admire the new logo Ela’s commissioned by Lee Newham, Creative Director at Designed By Good People (yes, another local resident), which is fittingly based on Sydenham station’s vintage railway sign. Imminent champagne reception at Jill Community Hub, 27 Sydenham Road, Sydenham SE26 5EX on Thursday 18th April 2013 at 7.00pm. First fill your glass with champers and then stuff your mind with interesting facts: local historian Steve Grindlay will be giving his talk, Going Shopping –The History and Secrets of Sydenham and Forest Hill Shops. RSVP by Thursday 11th April to onthehoofcoffee@aol.com or via Twitter @onthehoofcoffee. Designed By Good People designed all the branding and the cups, not just the logo! I was served terrible, watery coffee and a stale croissant there this morning. When I pointed this out there was no offer of a replacement. I would never return and sadly go to Costa or similar for a proper drink. If you drop an email to email@foresthillsociety.com telling us which stall you were served at, we'll make sure that Ela hears about this. I know she will be upset and want to correct it.